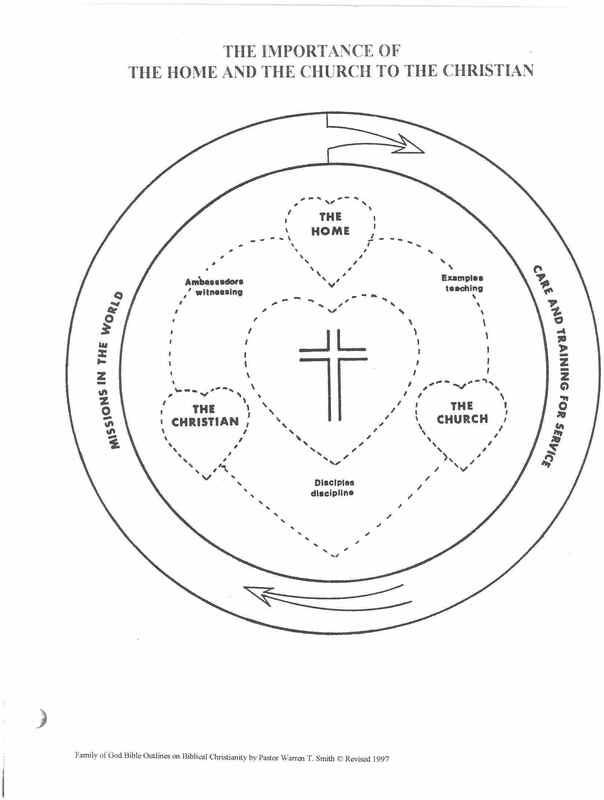 The Church as the Body and Bride of Christ. 1. Assignment: Look up all references given, and summarize them. The Church as the Body Of Christ. The Church as the Bride of Christ. 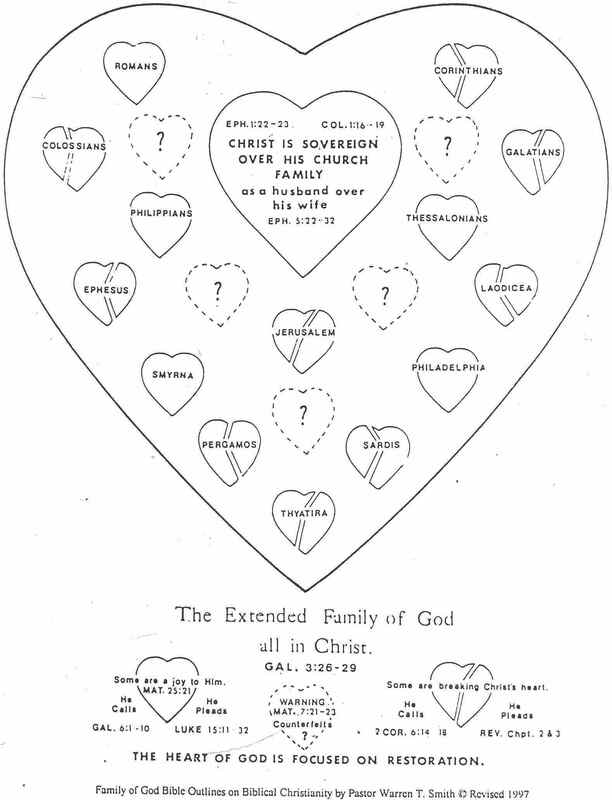 The Apostle Paul spoke of each Church as a member of the Family of God. Jesus writing the seven Churches of Asia as a member of the Family of God. The importance of the unity in purpose in the family of God. The Church as the Body of Christ. The Church as the Body is the instrument for God's work in the world. Remember as the individual is the primary unit in the family of God, so the local church family as a body of believers is the primary unit in the extended family of God. There is no room for doubt that the work of the church is evangelism and discipleship seven days a week. Obviously meeting in homes could not accommodate all the people at one time, even the use of synagogues could not have handle all the Christians in a given community. Therefore, they met in small groups on different days of the week, no doubt at different times of the day as well, to meet the needs of the converts. These cell churches spread over much of the then known world during the 1st Century, setting the pattern in God’s plan the church to be spread by dividing and multiplying. This is a glaring testimony as to the priority the early Christians had for meeting together to learn of the Lord and His ways that is missing today, Any wonder they were blessed and we are not. Note: Keeping His bride holy and righteous is by His Word. Remember each member of the local church is a part of that body of believers or family of God, that is to be His bride. They are to be collectively working together, functioning as Christ in their local community, through which the will and work of God, as well as His character, is seen or manifested to those around them. The responsibilities of functioning as Christ in the world must be accepted individually or they cannot be manifested collectively as a church, the body of Christ, in the family of God. Therefore, Jesus Christ is the only head, and authority over the church. He is sovereign over each in Him, individually or collectively as the church family. As each local church family is made up of many individuals and families so the extended family of God is made up of many local church families. The first clear picture of this concept is seen in the family of Jacob, whose twelve sons became the twelve tribes of many families that comprised the one family of God, the nation of Israel. The Apostle Paul spoke of each church as a member of the family of God. The Church of Jerusalem: The first church council was held there, but they were homebody's that required persecution to get them to scatter and multiply. The church of Rome: This letter of instruction was sent to them by the Apostle Paul while he was at the church of Corinth. This church was established without doctrinal instruction. The church of Corinth: The Apostle Paul wrote them instructions as a result of their letter of request to him while he was at Ephesus, and also perhaps when he was at the church of Philippi. This church had many worldly practices, and those living in sin in it. This church needed discipline and holy living. The church at Colossi: This church sent messengers to Paul while he was in prison in Rome to which Paul sends instructions concerning their problem. This church was heavily influenced by Gnostic heresy and philosophy. The church of Galatia: Was probably written to by Paul while he was at the church of Ephesus. This church had a problem with religious legalism. The church of Philippi: This was a faithful and benevolent church. Note: The spiritual condition of each church was different. Each one was in a state of immaturity, which Paul was striving to correct in some area or another. Some were grossly in error. Some had a miserable testimony as a whole. But Paul counseled them as a part of the family of God to correct their errors, clean up their walk with the Lord, and each other as the children of God. The church of Ephesus: ("Desirable" as a bride is to her groom.) A backslidden church, left its first love. The church of Smyrna: ("Myrrh" must be crushed to give off a fragrance.) A faithful church, that loved the Lord and gave their lives for their testimony of Him. The church of Pergamus: (Marriage) Tolerated corrupt doctrines and heretics, were unequally yoked. The church of Thyatira: (Continuing sacrifice) Had lax discipline, and tolerated a corrupt prophetess, bringing in heresy. The church of Sardis: (Remnant) Unequal yoking of those with spiritual life among the spiritual dead. The church of Philadelphia: (Brotherly love) A church that loved the Lord and each other. The church of Laodicea: (Peoples rights) A democratic church seeking the will of the people rather than the will of God, having no spiritual substance, only religion. Note: Both the local and extended family of God has been weakened by carnal (worldly) living children of God. It has been infiltrated and polluted by the unsaved, and blasphemed by apostasy. 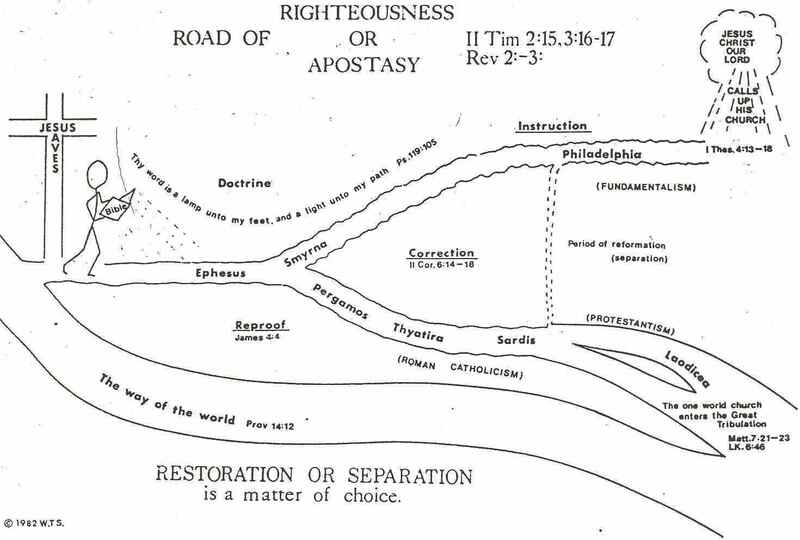 So let's learn of the Lord's heart for His churches as He sees them come to the fork in the road to Biblical Christianity or Apostasy. Background: Rev. chapt. 1. Jesus speaks to His churches as their eternal, Almighty God and Saviour, their sovereign Lord. He speaks to the pastors of His churches, represented as stars to give light to His people. They are His messengers or servants represented as angels. Although they have authority to lead the church in His place, they are in His hand. He is still sovereign and addresses the angel as the watchman of His churches. (read and Consider: Ezek. chapt 33 & 34) These churches were literal churches founded by Paul and existed at that time, the conditions of each were more prevalent in the churches at specific periods of time. They also represent a progressive condition of the church in relation to the time of Christ return. This is evidenced by the fact that these conditions also prevail in various churches today. Therefore, He calls for us today as He did then. . . ."He that hath an ear, let him hear what the Spirit saith unto the churches;"
See the Lord's heartbreak over their leaving their first love. Hear His call to their first work of loving Him, as He loves them. Note: the deeds of the Nicolaitans may have been idolatry and immorality. It could also be a reference to the name of those that sought to "lord over the people" and establish a priestly order of the clergy. It is most likely both. Also note the Lord hated the deed not the doers. See how God hates religion, as it substitutes religious works for a relationship with Him based on His work for them. But also notice His heart of grace for those that love Him in spite of it. Rev. 3:1-6 The church in Sardis: (remnant) This age begins with the reformation, it represents all dead Protestantism, which failed to come out from the apostate catholic church. Only separating from its governing body, while carrying on its sacraments. His commendation: Is only for a remanent of true believers who kept themselves pure. His rebuke and call: "And unto the angel of the church in Sardis write; These things saith he that hath the seven Spirits of God, and the seven stars; I know thy works, that thou hast a name that thou livest, and art dead. Be watchful, and strengthen the things which remain, that are ready to die: for I have not found thy works perfect before God. Remember therefore how thouhast received and heard, and hold fast, and repent. If therefore thou shalt not watch, I will come on thee as a thief, and thou shalt not know what hour I will come upon thee. Thou hast a few names even in Sardis which have not defiled their garments; and they shall walk with me in white: for they are worthy. He that overcometh, the same shall be clothed in white raiment; and I will not blot out his name out of the book of life, but I will confess his name before my Father, and before his angels. He that hath an ear, let him hear what the Spirit saith unto the churches." See his great love for this church, and the intimate relationship of their service with the Lord. Remember the Apostle John who teaches us most of what we know about the love of God and love of the brethren. He was the disciple Jesus loved most of all, who also had such a close relationship with Him. That's the relationship I want with my Lord, too. How about you? This is the only church the Lord has nothing to say to them but to rebuke, with a broken heart. He must even give up speaking to the pastor [the angel of the church] and calls for any man to hear Him. Heartbroken He stands at the door of the church He gave himself for!....Seeking any man to want fellowship with Him. Think about it! How lonely, and heartbroken He must feel over His bride, the church. Even its pastor is unaware Jesus is not in their midst, and does not hear His cry. So Jesus calls to any man to open the door of that church to Him! Jesus has been treated this way for almost 2000 years. "He came unto his own, and his own received him not." John 1:11 Yet our wonderful Lord receives any that come to Him. What humility, love, mercy, and grace He shows to us. Still He stands at the door, of the church rejected by those He gave Himself for, ready to receive any man that open the door and receive Him. Does not Jesus desire that we all share His heart for restoration of His church, especially His appointed under shepherds of the flock of His heritage? Self test on the Church as the Body and Bride of Christ. These questions are more than an academic quiz, they help you think through the facts you have learned, so that you can form convictions as to the will of God for your life. Remember meditation on God’s Word is the key to gaining wisdom, and only when it is applied in your life are you assured of being in the will of God and the place of His blessing. Q1. 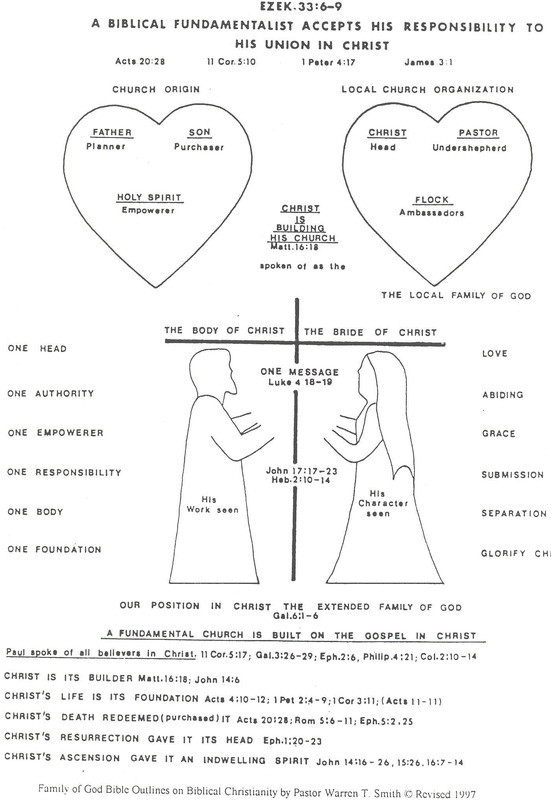 In what way does the church to manifest the body of Christ differ from the bride of Christ? Q2. In what way is the church to manifest itself as the bride of Christ? Q3. How are those fulfilling their responsibilities as the bride of Christ respond to those that are not doing so? Q4. What must those in the family of God be on guard for and what must they do about it?